This high-domed musk turtle ranges over the eastern half of the United States and is often observed fleetingly in ponds and lakes by fishermen and swimmers. 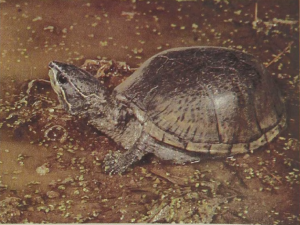 It is the most common member of a group of three musk and five mud turtles in the United States. Most of the other species have much smaller ranges, mostly in the southeastern United States, with some found in the southwestern states and Mexico. The pointed snout of the musk turtle is always recognizable by the two white lines forming an angle on each side. The plastron has two prominent hinges so that the shell can be closed tightly when the animal is disturbed. The name Stinkpot derives from the pungent secretion produced by glands at the margin of the shell and expelled when the turtle is removed from the water.